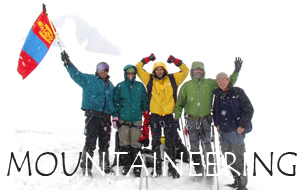 14 days fully supported mountaineering tour. Summit the 4374m Khuiten peak, highest in Mongolia. Maximum altitude acclimatization and one leeway day. Quality outdoor and climbing equipment is provided. This tour is designed for both climber and trekker. Climbers attempt Mt. Khuiten, the highest mountain in Mongolia, while trekkers explore the remote regions near Base Camp. 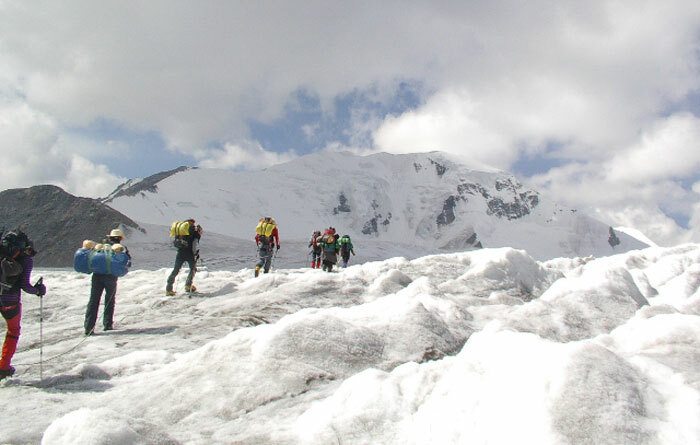 Both trekkers and climbers attempt the non-technical Malchin peak 4032m. The majestic Khuiten Mountain is the highest peak of Mongolia and offers magnificent natural scenery. The elevated at 4374 meter/14434ft, the peak stands at the crosspoint of three countries Russia, China and Mongolia. Glacier and snow are permanent in the area so we will walk on the snowcapped mountain. Here, a fantastic and adventurous journey awaits any trekker and climbers. Day 3. Head to Altai Tavan Bogd National Park. Day 4. Arrival at the Shiveet Khairkhan mountain. Day 5. Horse trek to Base camp with camels loading our luggage. Day 6. Acclimatization day. Climb Malchin Peak. Day 7. Move to advanced camp at Honog Tolgoi (hill). Day 8. Climb Khuiten Mt and possibly Nairamdal Peak. Day 10. Return to base camp and back to trail head. Day 11. Drive to Olgie Stay at Tavanbogd (Five Peaks) hotel. Day 12. Fly to Ulaanbaatar. Arrive in the evening. Day 13. Shopping and private arrangements. Day 14. Transfer to the Airport. Depart from Ulaanbaatar. This trip originates in Ulaanbaatar(capital city), Mongolia. Once you land in Ulaanbaatar, your adventure really begins. Transportation: Mongolian Altai Mountain’s sheer size requires the implementation of a wide variety of resources to reach it’s most amazing destinations. Horses and Camels All group gear, satellite phone and safety equipment. A deposit of $500.00 per person is required to reserve a trip with Explore Altai. The remaining balance is due 60 days prior to the start of the trip. Reservations made within 60 days of the trip starting date require payment in full. If the participant cancels a reservation earlier than 60 days prior to the starting date, the deposit will be refunded, minus a $500.00 administration fee. If the participant cancels within 59-31 days of the starting date, 50% of the trip balance will be refunded. If cancellation is made within 30-0 days of the trip starting date, there will be no refund of any costs. Please email us for details.